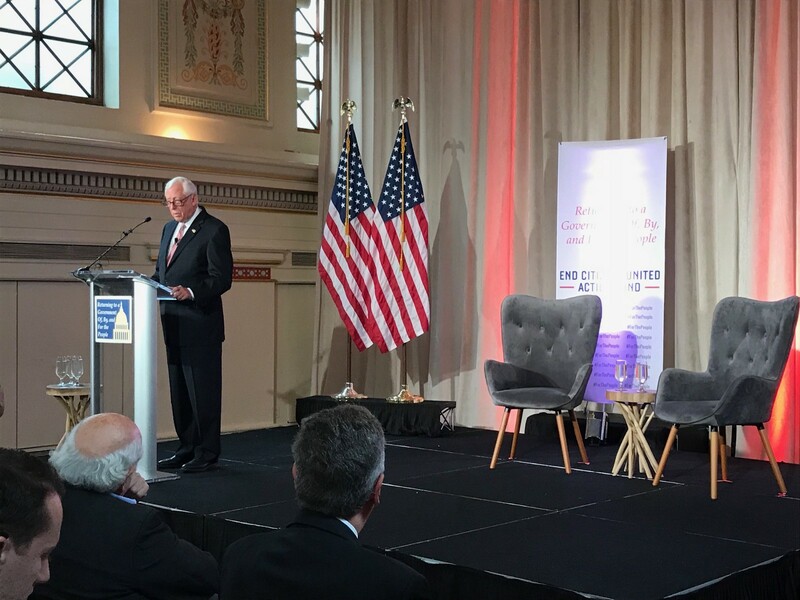 Whip Hoyer delivering remarks at Union Station on returning to a Government Of, By, and For the People. It’s hard to get American voters from across the political spectrum to agree on many issues, but there is one on which there is virtually unanimous opinion. Most Americans recognize that Congress is broken and that the government meant to serve them isn’t working the way it is supposed to work. It’s no wonder so many of our people believe that the system is rigged against them. Meanwhile, our most pressing national challenges aren’t being solved, let alone addressed. That’s why Democrats, if entrusted with the House Majority in November’s election, will take new and immediate steps to address this crisis of trust. Last Wednesday, I announced that a Democratic Majority would package voting rights, ethics, and campaign finance reform measures into a single government-reform bill and act on it during the very first days of the next Congress, along with a set of changes to House rules. A new Democratic Majority will work to put our government back in the American people’s hands — to make it responsive, representative, effective, and transparent. If we can show the American people that we are able to root out corruption and make government work again, the voters will trust Democrats to lead in meeting the other challenges we face, such as lowering health care and prescription drug costs, investing in infrastructure, and expanding opportunity. 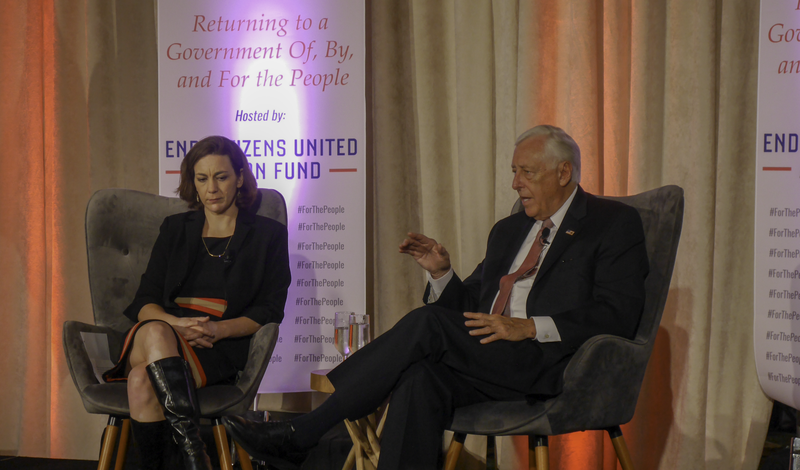 Whip Hoyer and End Citizens United President and Executive Director Tiffany Muller answering questions from the audience on the importance of government reform. To make government more responsive, we need to reduce the corrupting influence of money in our politics. That’s why we will pass the DISCLOSE Act to require the disclosure of SuperPAC donors. We should also impose stricter reporting requirements to improve transparency, including a new forty-eight-hour disclosure requirement for all large contributions to independent expenditure organizations. In addition, following the lead of my colleague Rep. John Sarbanes (D-MD), we will work to create a system of fair election financing by passing the Government By the People Act so candidates have an alternative to soliciting private donations from a small number of powerful donors. A responsive Congress is also one that provides fair, honest, and thorough oversight of the executive branch. The Trump Administration has committed one outrage after the next, from botching the response to last year’s deadly hurricanes to sabotaging our health care system. A Democratic House would hold government officials accountable again. Next, we need to make government more representative. This begins with securing our election systems and restoring the full power of the Voting Rights Act. But that isn’t enough. We also need to make voter registration automatic, fully fund the Election Assistance Commission, and restore voting rights to those who have paid their debts to society. And we need to pass real, bipartisan, national redistricting reform. We also have to make sure that those who serve in office and work for the American people are held to the highest ethical standards. This means requiring the disclosure of tax returns for presidential and vice presidential candidates as well as strengthening the Office of Government Ethics to beef up ethics rules and enforcement. It also means banning Members of Congress from serving on corporate boards, something the Senate already prohibits. It is imperative that our government is effective at meeting the needs of Americans. To do this, Democrats intend to change the way Congress works by restoring regular order; allowing committees to write legislation is a first step. But there are other reforms that could help, which Members have proposed. Some proposals worth exploring include allowing Members whose bills have received a certain number of cosponsors to force committee action. It’s also time to bring back Congressionally directed spending with the strong reforms that Democrats put in place when we were last in the Majority, because Members know the needs of their districts better than federal agencies. 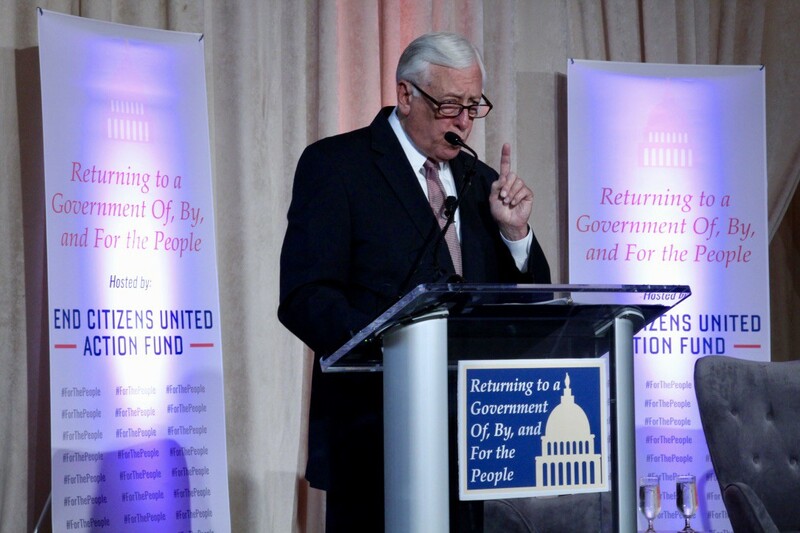 Whip Hoyer during his speech on how Democrats plan to renew Americans faith in government by passing a comprehensive government reform package in the opening days of the next Congress. Another important way to make government more effective and transparent is to modernize the technology used to connect with constituents. That’s why I launched the Whip Watch iOS app to help Americans know what’s happening on the House Floor and why I’ve worked across the aisle to promote greater access online to legislative data. But that’s just a start; we need to launch a Congressional Digital Service to help develop new platforms that ease communication between Americans and their representatives and create a Congressional Transparency Officer, among other changes. These reforms may seem ambitious, and they are. Democrats know how important it is to fix the tools of government if we intend to use those tools to expand opportunity for Americans. The work won’t be easy, but it is necessary. If given the opportunity, Democrats will do everything in our power to renew Americans’ faith that their government is truly “of the people, by the people, and for the people” — and can serve them faithfully for generations to come.